The Billikens have lived up to expectations early in the season, opening conference play with a 5-1 record. Javon Bess has lead the charge averaging 17 points per game and winning SLU's first A10 player of the week since 2014. 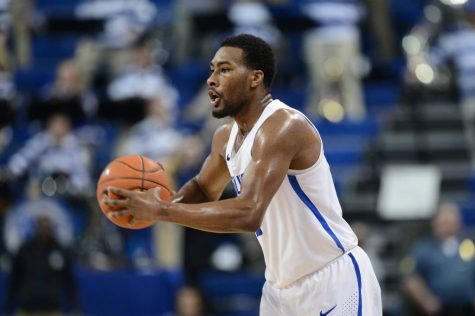 Travis Ford’s Billikens entered conference play with something new this season, expectations. Being named the preseason favorite to win the A-10 in the media day coaches’ poll, the Billikens would have a name to live up to for the first time since Coach Ford came to St. Louis. With a strong non-conference performance to back up the name they’ve made for themselves, they knew they would have a target on their back. 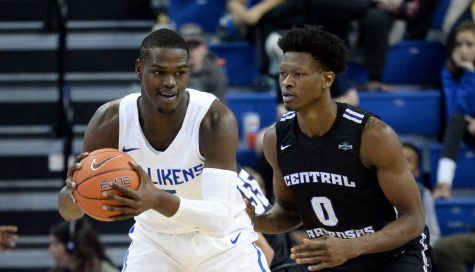 Yet, the Billikens faced their first test when freshman forward Carte’Are Gordon opted to withdraw from SLU in order to pursue other basketball opportunities. 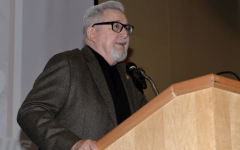 The departure forced the Billikens to reevaluate the way in which they go about utilizing their roster, as Gordon’s presence was key to the two big sets they would often go with. Gordon was not the only freshman who chose to withdraw early in the new year. Freshman guard Ingvi Gudmundsson opted to return home to Iceland. Gudmundsson had an extraordinarily difficult first semester at SLU. 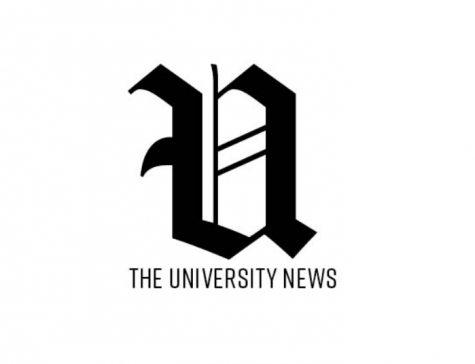 Aside from the difficulties of being an international student, Gudmundsson suffered appendicitis and was forced to have his appendix removed in an emergency surgery. Having only appeared in two games this season, it makes the decision to return home understandable. 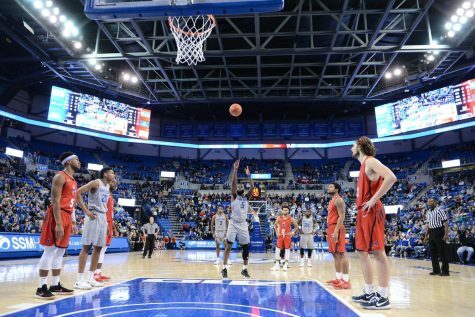 The newly shortened Billikens roster have not led to many new problems on the court though, as the Bills have stormed out to a 5-1 record in A-10 play, including remaining undefeated in Chaifetz Arena, winning their first five conference tilts before losing to Duquesne. The Billikens have proven themselves to be top notch competitors, not only in the conference but on the national scale. 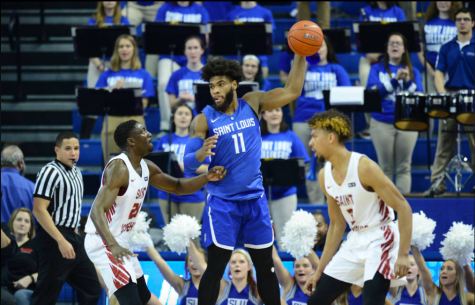 The Billikens boast a top-15 defense in the country, and their progressing offense has garnered them respect. 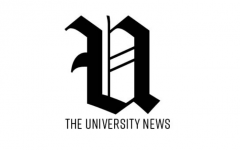 In the week of the Jan. 21 AP Media Poll, SLU began receiving votes. The Billikens are, in many ways, living up to their expectations. 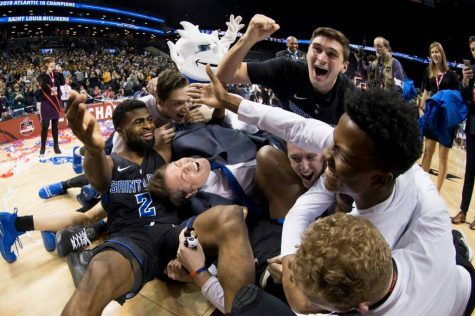 In addition to their receiving votes status, ESPN’s Joe Lunardi (who runs ESPN’s bracket projections for the national tournament in March) has the Billikens seated as a 12 seed in the tournament. 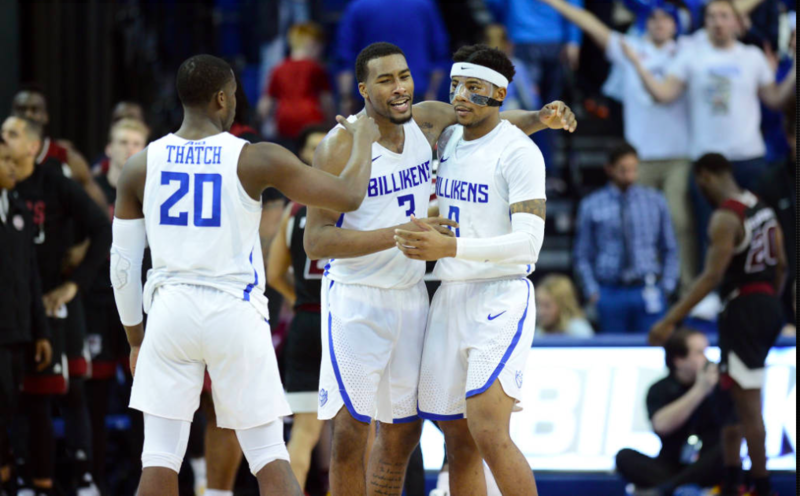 Their early season success can in many ways be attributed to the stand-out performances of a select few Billikens, namely Javon Bess and Hasahn French. Bess has been the backbone of the Billikens, averaging 37 minutes a game and a team high 16 points per game. In addition to his output, he is Coach Ford’s go-to man in regard to defense, consistently being asked to guard the opposing team’s top scorer. French has taken advantage of his increased role due to Gordon’s absence. French has been a double-double machine averaging 16.2 points and 9.6 rebounds per game, recently scoring a career high 25 points in a win against UMass. 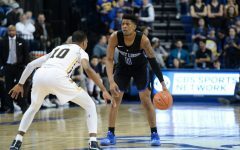 The Billikens are poised to make a deep run in the A-10, and potentially the national tournament. But they are consistently haunted by a few team problems that may ultimately get in their way. An anemic offense, despite showing spirits of extraordinary potential, is still holding the Billikens back. 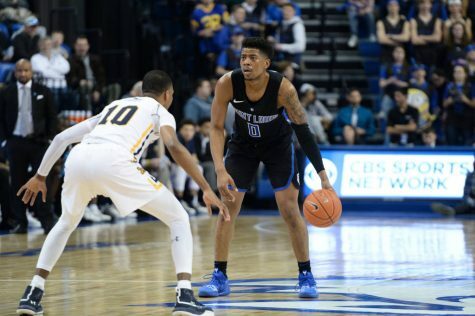 Averaging a meager 67 points per game, the Billikens are often playing in close games against teams they should be dominating. Case in point, their three-point wins against UMass and Fordham (both games in which they should have been able to dominate), a meager win against LaSalle and their most recent four-point loss to Duquesne. 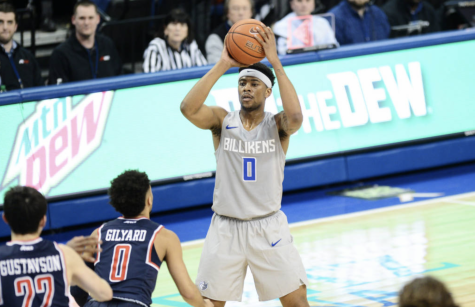 While the loss may look better at the end of the season, as Duquesne has been the surprise of the A-10, the Billikens are making games against bad opponents look difficult. They could make their lives a lot easier come March when they may be looking for an at-large bid in the NCAA Tournament if they dominated the games they are supposed to dominate. Fortunately, many of these offensive problems may be fixable. Their primary issues appear to be a lack of movement in the half court, and terrible free-throw shooting. Both of which have seemed to be getting better in recent weeks. The Bills dominated Saint Joseph’s, a win that included a 23-0 run in the second half, and in the loss to Duquesne the Bills put up 73 points (despite a 2-19 three-point shooting performance), including a much improved 19-22 from the free-throw line. So, while they may not be perfect, they may be peaking at the right time. An additional problem the Bills may face going forward is their health. 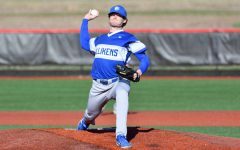 The Billikens currently only have nine scholarship athletes available and are running a solid eight-man rotation. With players like Bess, French, Jordan Goodwin and Tramaine Isabell Jr all averaging 30 minutes a game, it will be important to manage the impact and pressure to their physical. 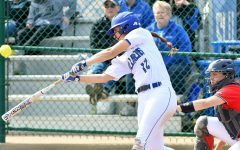 These starters are key to the short and long-term success of the Billikens. The Billikens face a difficult road ahead. The A-10 is very competitive at the top this season with VCU, Dayton and Davidson all with legitimate shots at the A-10 Championship and all looking to hedge their bets with competitive at-large bid resumes. Fortunately, they control their own destiny. The Billikens will invite Davidson into Chaifetz Arena on Saturday, Jan. 26, looking for their 12th straight win at home, a would-be record for consecutive games won at Chaifetz.